The popularly held myth that the American Constitution is the beacon of global democracy blatantly disregards democratic norms in several instances. Robert Dahl, a Sterling Professor Emeritus of Yale University and former President of the American Political Science Association, examines the ways in which the Constitution does not practice equality of representation. Most notably, both the Senate and the Electoral College distort the value of votes, resulting in votes from Wyoming worth four times that of votes in California. Dahl discusses alternative systems of representation and presents viable solutions to making the United States a stronger democracy. Circumstances constrained the framers construction of the Constitution in three ways: (1) Only a republican form of government was viable (11). (2) Due to the existence of the thirteen colonies, a federal system was a requirement and a unitary republic not an option (12). (3) Two compromises could not be avoided, slavery and representation in the Senate (12-14). The initial Constitution contained seven shortcomings that limited its democratic nature: (1) It allowed slavery. (2) It failed to guarantee the right of suffrage. (3) It created the Electoral College and insulated the President from a popular majority. (4) Senators were to be chosen by state legislatures. (5) The establishment of a bicameral legislature. (6) The judiciary did not receive any limits on its power to declare laws unconstitutional. (7) The powers of Congress have been more constrained in regulating the economy than other democratic states (15-20). These undemocratic principles in the original Constitution are not the intentions of the Framers but the result of an emerging understanding of how democratic institutions operate. Mainly, the Framers overestimated the dangers of popular majorities. Some, however, are the result of the compromises that were necessary in order to gain sufficient support (38-39). Equal representation in the Senate has failed to protect the rights of underprivileged minorities while giving disproportionate rights to highly privileged minorities such as slave owners (52-53). The United States uses a first-past-the-post election system in which the winner of each election is dictated by the majority vote. The system produces two-party systems with one party usually gaining a slight majority. In contrast, proportional representation gives a proportional number of seats to a given party based on their votes and results in both multiparty systems and coalition governments (61). The President holds a unique position among democracies being both the head of state and the chief executive. Essentially, the President is the equivalent of a prime minister and a monarch combined (72). The Electoral College severely distorts equal representation. Not only is it possible for a President to win the popular vote but not the election (which has occurred in four elections), but individual votes and their impact on the result vary a great deal state-to-state. For example, a vote in Wyoming is worth about four times as much as a vote from California (79-82). Two solutions could make the Electoral College more democratic. A constitutional amendment that abolishes the Electoral College in favor of a direct election by popular vote would be highly desirable. If no candidate received a majority, a run-off between the two top candidates should be held. Alternatively, the Electoral College could be fixed by distributing votes to candidates proportionally (86-87). For developing or new democracies, choosing a presidential or parliamentary system is largely irrelevant. Scholars have not come to a consensus regarding which system offers the greater potential for survival. Empirically, there is little reason to attribute differences of liberties and rights to constitutional systems (96-99). Proportional representation systems come closer to representing the interests of the electorate than majoritarian systems (101). Proportional representation is far more effective at building consensus within governments. Voters of the losing party are almost as satisfied as the winners whereas in a majoritarian system, voters are much more dissatisfied if they are of the losing party (108-109). The American system is a hybrid of proportional and majoritarian systems and possesses the strengths of neither but the defects of both (110-115). Neither majoritarian nor proportional democracies clearly outperform one or the other on macroeconomic effectiveness, control of violence, quality of democracy, or democratic representation. In other words, a constitutional system does not sacrifice between democratic principles and executive effectiveness (118). In opposition to Tocqueville’s assertion that equality erodes liberty, democratic institutions strengthen and are absolutely essential for liberty 133-137). Resources are also an attribute of political equality. Unrestricted campaign finance distorts the public’s ability to participate in the political process, curtailing an individual’s ability to effectively voice his or her opinion (150-152). The Supreme Court has evolved into an incredibly powerful government power that does not answer to the electorate. This power is derived from its ability to legislate through judicial review, a process that should be the sole domain of elected officials (153-154). Despite the highly undemocratic nature of the Senate, an amendment that significantly alters this constitutional body is unlikely to be enacted (160-164). A proportional representation plus single member districts system is a potential solution for the House of Representatives to more accurately represent the electorate. Half of the House would be elected by district, as it is now, while the other half would be determined by proportional representation. Many scholars consider this the best of both worlds for proportional representation and majoritarian systems (170-175). This book should be required reading for every college freshman. If you cannot readily list several ways that the Constitution is not democratic and why, put this book at the top of your reading list. Keep in mind that this book is an incredibly brief overview of complex topics that do not lend themselves to easy solutions through policy and that Dahl clearly advocates for certain policy prescriptions. His prescriptions may not be ideal and should not be adopted without an extensive review of the full range of literature. One of the primary strengths of Dahl’s book, its accessibility, also produces a consistent lack of depth throughout the book. 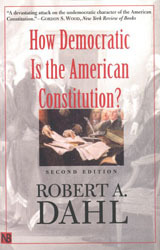 For example, Dahl summarizes the debate between parliamentary and presidential systems for new democracies in only a few pages. Any student of electoral systems will desperately want more depth. However, an academic review of the literature on systems of representation would undoubtedly bore many to tears. In other words, the book’s briefness provides accessibility that may be more important than an irrefutable review of the vast work already done on these topics. His book lacks in depth and his specific arguments suffer because of it. However, his primary point that the Constitution is not as democratic as popular opinion claims is supported effectively. While Dahl does discuss the Senate and the Electoral College at length, he does not address major counterarguments in support of these institutions. For example, popular vote by majority at a national scale creates a highly inefficient voting system, resulting in a greater probability of human error. Recounts also become highly problematic at a national scale. Dahl simply does not address these issues. While he does effectively argue against the fear of majority rule and provide substantial evidence that many of the Framers recanted their positions against majority rule after the implementation of the Constitution, other counterarguments go unaddressed. Unfortunately, Dahl’s third primary critique of the current American political system, the Supreme Court, receives a cursory examination. Dahl contends that the Supreme Court’s ability to essentially legislate through judicial review gives it undeserved power that should be left to the legislature. Dahl does not mention that the Justices to the Supreme Court are held indirectly accountable to the electorate through nomination by the President and approval of Congress. Instead of providing an analysis on whether or not this indirect accountability to the electorate is effective, he simply ignores it. Dahl, Robert A. How Democratic is the American Constitution? Yale University Press: New Haven, 2003.